Want to be a certified SF2 Rebreather Diver? … then our Rebreather Offer is just the thing for you! Learn to handle with the SF2 rebreathers and to dive …. Prerequisite is OWD (20 dives) 6 Nitrox User or equivalent. 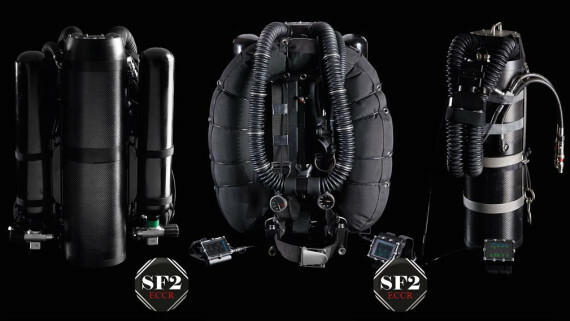 THe Entry-Level for Divers they like to dive with SF2 eCCR (Electronic Closed Circuit Rebreather) for Dives up to 30m / 100ft. The Course includes all the knowledge about advantages, problems, troubleshooting and trainings for the ECCR System. Diluent is always air and no decompressions allowed. other courses with higher ranges can be also organized here. • min. 20 Open Water Dives logged. 8 Dives within 480 Minutes and about 8 houres practice theory. Do you just want to know how it is to dive without bubbles?